MainAll NewsJewish WorldWho does the Western Wall belong to? 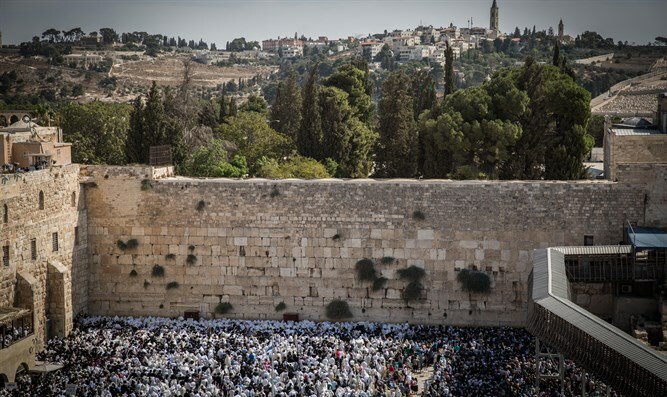 Who does the Western Wall belong to? Chief Rabbis demand regulations for the preservation of holy sites be changed so that the authority is exclusive to the Chief Rabbinate. Religious Affairs Minister David Azoulay appealed Wednesday to Justice Minister Ayelet Shaked in order to receive her opinion on the amendment of the regulations at the Western Wall, as requested by the Chief Rabbinate. "According to the Law for the Preservation of the Holy Places, the enactment of these regulations requires the consent of the Minister of Justice. I request your reference to this letter and your position on the matter," wrote Azoulay. In a letter sent by the Chief Rabbis to the Minister of Religious Affairs yesterday, the Chief Rabbis demanded that the regulations be changed to preserve the holy sites. The letter of the Chief Rabbis, sent after the meeting this week of the Religious Sites Committee did not result a decision, sent a clear message to the prime minister and his attempts to promote the expansion and renovation of the expansion in favor of the egalitarian plaza at the Western Wall. The rabbis are attacking the attempt of a small and marginal group to desecrate the sanctity of the Western Wall for years in the heads of months: "These groups hold their ceremonies demonstratively and defiantly against the Torah of Israel and against everything sacred. Who pray that they should shed a dialogue in front of them, as is the practice of women in Israel throughout the generations. "The plan has indeed been frozen by a government decision, but despite this, there continue to be mixed prayer services, men and women together, without a barrier, in complete contradiction to the custom of the place and severely harming the sanctity of the Western Wall. This is severe desecration of the Holy of Holies under all halakha." In conclusion, the rabbis turned to the minister and demand that the ministry act to change the regulations so as to clearly define "religious ceremonies at the Western Wall only in accordance with the customs of the place and the tradition of Israel for generations." Legal sources report that this requirement of the Chief Rabbinate may put an end to all the demands of the Reform Movement, since after the amendment, there will be no possibility of the Supreme Court instituting an interpretation that is contrary to Jewish law and tradition by the Western Wall. It should be noted that according to the law, the authority which is authorized to amend the regulations is the Minister of Religious Affairs, at the request of the Chief Rabbis.